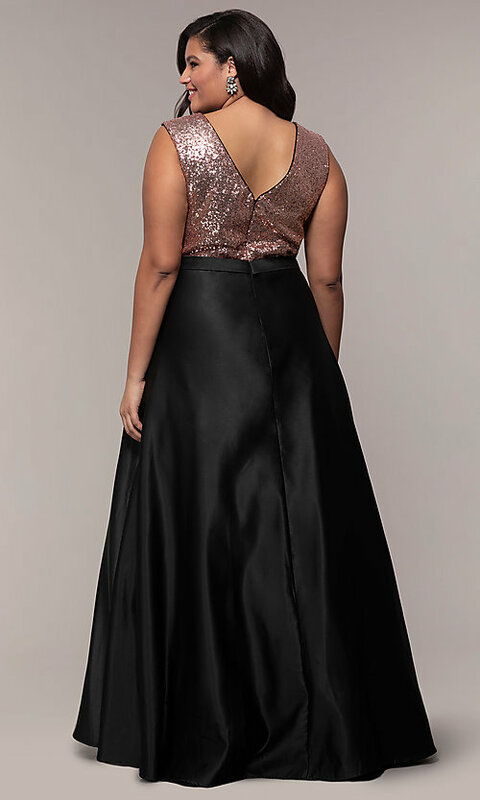 Look confident and feel pretty in this sequin-bodice plus-size prom dress. The flatteringly pleated v-neck bodice is covered in gold sequins, and a mirrored v-back detail adds balance and allure. A black tulle-lined satin skirt joins the bodice at the natural waist and flares to the floor in a dramatic and flattering a-line shape. For added convenience, the skirt has side pockets. At under $200, this plus-size prom dress is both fashionable and budget-friendly. For prom 2019, a pageant, or another formal event, wear this sequin-bodice plus-size prom dress for a beautiful two-tone look that stands out.